Honor Show Chow Showlamb Grower DX feed is a completely balanced, high energy feed for growing show lambs and breeding sheep. Honor Show Chow Showlamb Grower DX feed is supported by Purina Mills Animal Nutrition. Get your best animals on Honor Show Chow Showlamb Grower DX feed today so they can reach their full potential. Balanced rumen degradable and undegradable protein sources improve growth and muscle synthesis. Research has shown that TASCO® helps lower body temperature during heat stress – helping keep animals on feed. 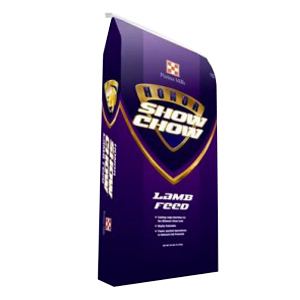 Honor® Show Chow® Showlamb Grower DX is designed to be fed to grow/finish lambs intended forthe show ring. We recommend feeding each lamb¼flake or¼lbs of a good quality hay per day along with Honor® Show Chow® Showlamb Grower DX. This feed may be fed to show lambs of any age or weight. Feed 0.3 lb of Honor® Show Chow® Showlamb Grower DX per 10 lb body weight to provide 22.7 mg Decoquinate per 100 lb body weight daily. Always provide plenty of clean, fresh water. Feed at least 28 days during periods of exposure to coccidiosis or when it is likely to be a hazard. Caution: Do not use in feeds containing bentonite. Warning: Do not feed to sheep producing milk for feed. Reminder: Feed is perishable and should be stored in a clean, dry, well-ventilated area so it will remain fresh and palatable. DO NOT feed moldy or insect infested feed to animals as it may cause illness, abortion or death. Fresh, clean water should be available at all times.